The Lupo Carbon Ti Boots are lightweight alpine touring boots with a carbon spine, shaving 720 grams off the non-carbon version. The three-piece Cabrio shell design provides a smooth power transmission with a dynamic rebound. They have a flex rating of 130, which is able to drive larger skis on big powder days. 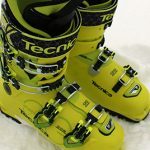 To make this a true quiver of one ski boot for the resort and backcountry, Dalbello would have to improve the walk mode’s functionality and ease of use. With the Lupo Carbon Ti boots, Dalbello has not moved away from their super successful Cabrio three piece shell since it’s a proven design that offers up good walkability and performance. They have added a carbon spine, which provides a stiff 130 flex rating and also lightens things up considerably. A removable tongue allows for an impressive 67° of cuff rotation which is unheard of for such a stiff boot. Combine this with Xtra-Grip Soles and an I.D. Max Hike Light Liner and you’ve got performance and comfort. The Dalbello I.D. Max Hike Light Liners are light yet comfortable. The heat moldable Ultralon EVA Foam is thick and supportive on your foot and the lace-up closure provides a snug fit. The liners have built in Easy Flex Walking Functionality, which works in conjunction with the Lupo Carbon Ti’s large range of motion. The 98mm last provides ample room for those with a wider foot but the toe box felt a little cramped especially when compared to other Dalbello boots or those from La Sportiva. Weighing in at 7.3 pounds or 3.3 kilograms for the size 25.5 boot, the Lupo Carbon Ti’s are the lightest Dalbello boot to date but still not light enough to be considered a dedicated, über light alpine touring boot. The use of a carbon spine shaves 720 grams off the non-carbon version, but the Lupo Ti’s are still considered a freeride touring boot, ideal for those that like to go big versus those who like to go far. Dalbello’s three-piece Cabrio design (tongue, cuff, and shell), provides a very smooth power transmission of energy to skis with a progressive flex that offers a solid dynamic rebound. This allows the Lupo Carbon Ti’s to drive a fat ski through variable snow conditions and steep challenging terrain. Forty degrees of forward flex with twenty-seven degrees to the back, provides sixty-seven degrees of total cuff rotation. While this is a substantial amount of flex in walk mode, you do have to undo each buckle and remove the tongue in order to achieve this. While this is not a problem on bigger walks it can prove to be more effort than the return for short skin track or boot pack climbs. Due to the 130 flex rating of the Dalbello Lupo Carbon Ti’s and their seven pounds (plus) weight, they are not a dedicated ski touring boot but better suited for slack country or day trips beyond the ropes. Because they can ski anything you through at them, they are ideally suited as a resort boot that can take you out of bounds when needed. 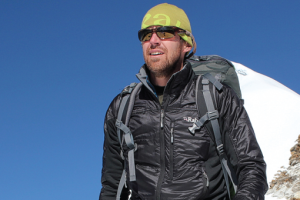 Brad Steele is the co-creator of BackcountrySkiingCanada.com, a one-stop-shop for skiers and riders seeking timely, on-the-money information. 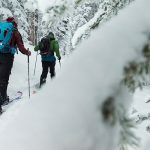 BackcountrySkiingCanada.com is where you’ll find route descriptions, product reviews, guides, videos, comps and other like minded people who are as amped on ski touring as you are.